His father, Louis, was a successful dentist and his mother Faye a homemaker. When Herbert was 11, his mother died, and he and his older brother Bob were raised by their father and a housekeeper. The brothers attended St. John’s Military Academy for their elementary education, but Herbert soon discovered that he wanted to study art despite the objection of his father. He put himself through school working as a student janitor and a few other odd jobs. At 17 he entered the Advanced School of the Art Institute of Chicago, his interest having turned from sculpting to painting. The family moved to New York City in the 1950s and the artist took on odd jobs to support his family. He became a member of Edith Halpert’s Downtown Gallery*, and in 1952 was was selected by the Museum of Modern Art to participate in it’s Fifteen American’s show. This was followed by many group and one-man shows. 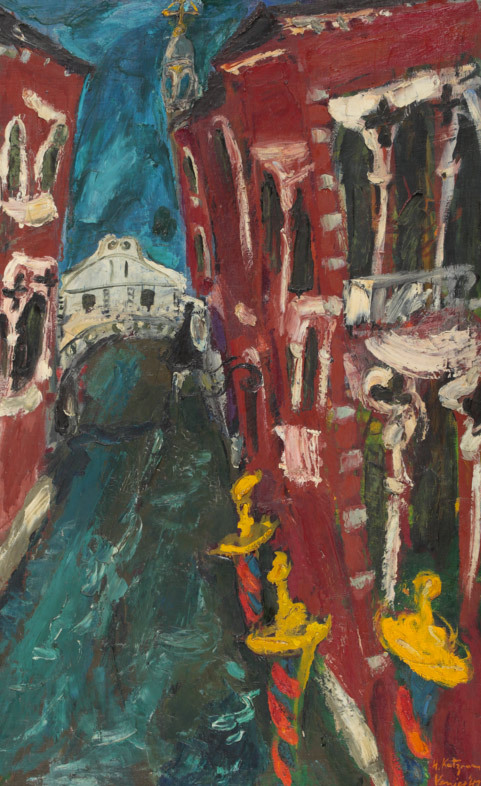 In 1955 he received a Fulbright Grant*, which allowed him to move to Florence, Italy for a year where he painted many landscapes of his surroundings and made numerous small sculptures modeled in wax and cast in bronze. Upon his return to New York in 1956, he found work as a teacher of painting at the School of the Visual Arts, New York*. For the next decades he painted landscapes and portraits, sculpted and created large drawings in chalk.